There were two art books for the original Lord of Vermilion, namely Black and White. Then for the sequel Lord of Vermilion II, there were Red and Blue. 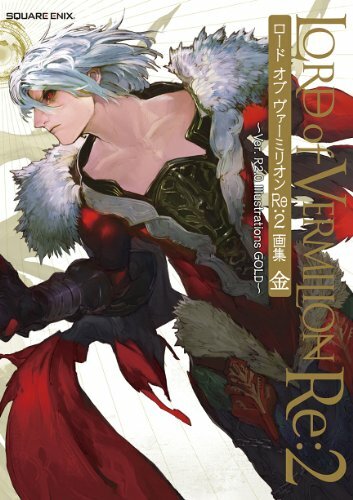 Now for Lord of Vermilion Re:2, there's this book which is Gold. The presentation format is similar to the previous art books. This is a 176-page paperback. It collects 140 pieces of illustrations from the collectible cards from Re: 2. I like the creature designs from these art books. However, in this volume, there's a larger portion of shoujo type female character designs. Their design style is a huge contrast to the creature designs featured. Additional concept sketches are at the back of the book. There's also one free mystery card attached. Considering that Lord of Vermilion isn't that huge in the US and that the only items that are related to the series are the PSP game Lord of Arcana and the PSP Vista game Lord of Apocalypse that were released here in the states. There's also the fact that no one would try to sell an untranslated art book without finding a company such as UDON to translate it.